CoolSculpting is everywhere right now. The company has increased their marketing efforts, and you can hardly drive down the street without seeing a CoolSculpting sign or banner. Our office took a hard look at the different technologies available and Katalin felt that SculpSure was a much better choice for our clients. While both technologies effectively destroy fat cells, they do it in very different ways, each with their own results. CoolSculpting is an FDA approved procedure called cryolipolysis or fat freezing. The equipment directs controlled cooling energy freezing your fat cells to destroy them. Over the course of the next several months the crystallized fat cells are filtered and eliminated by the body. To be a candidate for CoolSculpting, you must have pinchable fat. A suction-based applicator draws the skin and fat into the handpiece where the cooling energy freezes and crystallizes the fat cells. Treatment takes about an hour. Due to the length of time the treated area will take the shape of the applicator and kind of looks like a stick of butter. The affected area must be massaged before leaving the office to break up this unnatural shape. The treatment takes between 35-60 minutes. Clients have reported some discomfort with this procedure. Common side effects of CoolSculpting include numbness, tingling, soreness and bruising. It is marketed as a no-down-time procedure. SculpSure is an FDA approved non-invasive, laser lipolysis treatment to reduce fat cells. Using targeted lasers, the temperature of the fat cells is raised until they are no longer viable. Then over the course of the next several weeks and months, the damaged fat cells are filtered and eliminated by the body. The procedure takes about a half hour, and the skin is kept cool the entire time, even though the fat cells are being heated. Clients have reported a mild warming, tingling and/or cramping feeling during treatment. Following treatment, no pain or bruising has been reported, and clients can resume normal activities immediately. 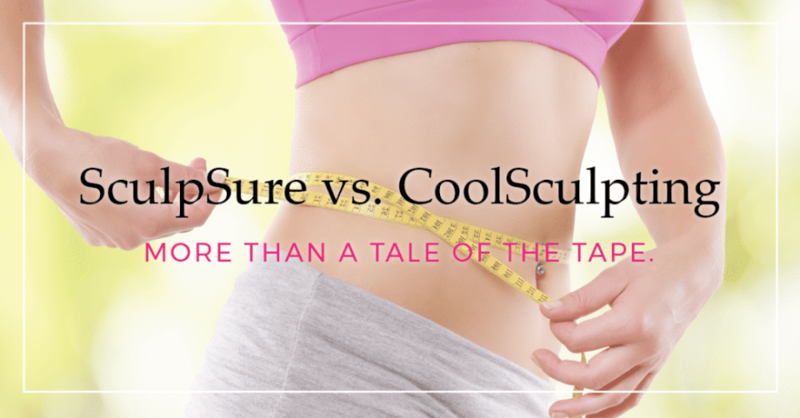 The heat from SculpSure tends to extend slightly beyond the treatment area providing the additional benefit of a natural transition area, rather than a line of demarcation that can happen with fat freezing. Up to four applicators can be used at one time, so large areas can be addressed or even multiple smaller areas. Because the applicators lay flat on the skin, this procedure can be used to target small areas that fat freezing cannot address. With the many benefits of SculpSure, we felt this was the better option for our clients. It’s faster, more comfortable and provides more natural results. SculpSure has the added benefit of skin tightening too! Contact us today to schedule your first treatment. Mention this blog post and receive $100 off your first treatment.